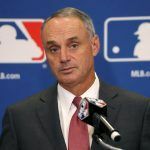 Major League Baseball doubled down on its stance that the league should receive money from casinos that profit from legalized sports betting, with a suggestion from Executive Vice President of Gaming Kenny Gersh that casinos pay MLB a 0.25 percent fee. “From a fairness perspective we think, if you are going to designate someone to be able to make money off of what at the end of the day is our sport and our events…we think we should be involved in that,” Gersh said at the Global Gaming Expo (G2E) in Las Vegas on Wednesday. Before a Supreme Court decision in May cleared the way for all 50 states to regulate sports betting if they choose, MLB tried and failed to get West Virginia lawmakers to impose a one percent fee on casinos that offer sports betting. The league also proposed similar legislation to the state of Missouri. Also present during the panel discussion at G2E was American Gaming Association Senior Vice President of Public Affairs Sara Slane. 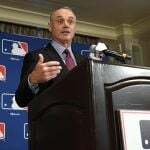 Slane said MLB’s proposal is “not financially viable” because casino companies, not the league, are responsible for the costs associated with the industry – such as license fees, regulatory processes, and building construction. “You want us to take that risk, pay you and then you are going to benefit on the back end as well,” she said. Slane referenced “the back end” earlier this year after the AGA commissioned a study which concluded a legalized sports betting market will increase popularity and engagement among younger fans for professional and college sports leagues. “Expanding access to legal sports betting will bring millennial audiences back to sports broadcasts and stadiums, which is a huge benefit for sport enterprises across the country,” Slane said after the study was published. When the monumental Supreme Court decision to strike down a federal ban on sports betting came in May professional sports leagues across America bonded together to shield their product from the very sort of capitalism that turned their sports into multi-billion dollar industries. 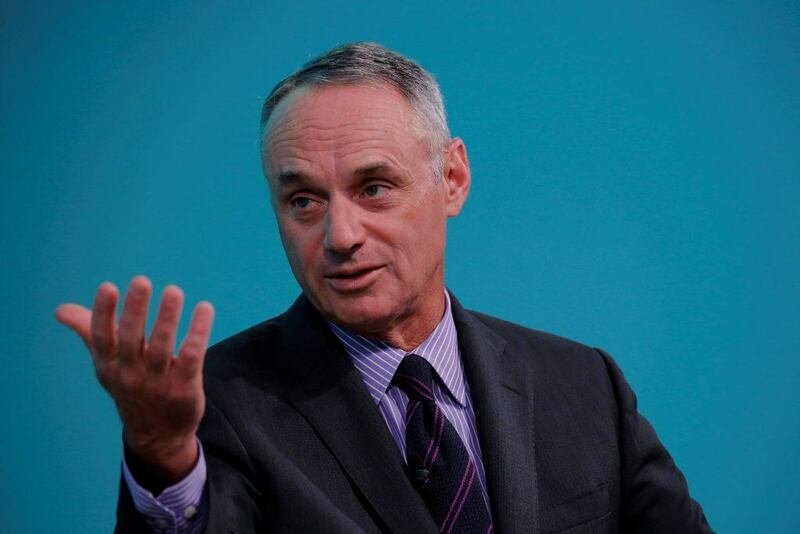 “As each state considers whether to allow sports betting, we will continue to seek the proper protections for our sport, in partnership with other professional sports,” an MLB statement following the decision stated. 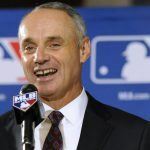 MLB initially floated the idea of a one percent fee to West Virginia and Missouri lawmakers earlier this year but appear to have come down from that number to 0.25 percent, based on Gersh’s comments at G2E. Like pro baseball, the National Basketball Association is also pushing for the fee. Commissioner Adam Silver has supported MLB’s initiative to receive some sort of payment from casinos. “From the NBA’s standpoint we will spend this year roughly $7.5 billion in creating this content, creating these games…so this notion that as the intellectual property creators that we should receive a one percent fee seems very fair to me,” Silver said at the 2018 NBA All-Star Game in Los Angeles. MLB is understandably weary of the integrity of the game. The 1919 “Black Sox” scandal and Pete Rose’s lifetime ban for betting on the game still hang over the game today. Now however, along with wanting a piece of the action the league is apparently considering moving closer to it. 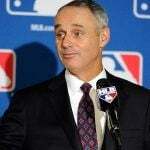 Manfred said last year that Las Vegas could be an option for the relocation of an MLB team and rumors circulated this week that the Rio Hotel & Casino in Vegas could be demolished as the future site of an MLB ballpark.